What proportion of girls and boys feel safe at school? What relationships are there with achievement? What’s the relationship with bullying? To examine these questions, data from the Trends in International Mathematics and Science Study (TIMSS) have been used. 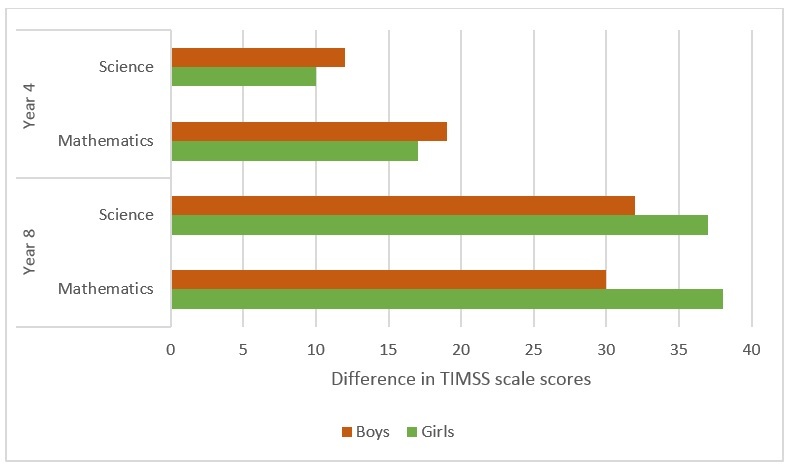 TIMSS data include information not only about achievement, but also gender and student perceptions about a range of factors thought to be associated with achievement, such as school safety in this instance. At both Year 4 and Year 8, the TIMSS student questionnaire asked students to what extent they agreed with the statement 'I feel safe at school', with response options 'agree a lot', 'agree a little', 'disagree a little', and 'disagree a lot'. For the analyses presented in this article, the achievement and beliefs of students who 'agreed a lot' with this statement were contrasted with that of all other students. This created meaningful group sizes and enabled us to identify significant differences between those who felt very safe and those who did not. On average, 59 per cent of Australian Year 4 students and 45 per cent of Australian Year 8 students strongly agree that they feel safe at school (a further 29 per cent of Year 4 students and 42 per cent of Year 8 students agree a little, which seems damning with faint praise). However there are significant gender differences in Australia, as in almost all of the other participating TIMSS countries. In Australia at Year 4, 65 per cent of girls and 59 per cent of boys reported feeling 'very safe at school'. By the end of Year 8, these proportions had declined to 50 per cent of girls and 46 per cent of boys (Figure 1). Achievement was analysed in mathematics at both Year 4 and Year 8 for both groups of students. At Year 4, girls who agreed a lot that they felt safe at school achieved, on average, 17 score points higher in mathematics and 10 score points higher in science than those who felt less safe in school (achievement scales have a mean of 500 and a standard deviation of 100). For Year 4 boys, safety in school mattered a little bit more than it did for girls, with the differences 19 score points in mathematics and 12 score points in science. At Year 8, the differences between students who felt very safe and those who felt less safe were larger, and were more evident for girls than boys. In mathematics, boys who reported feeling very safe at school outperformed their peers who did not report feeling the same level of safety by, on average, 30 points in mathematics and 32 points in science. However, girls who felt very safe at school scored, on average, 38 points higher in mathematics and 37 points higher in science than their peers. (Figure 2). being made to do things they didn’t want to do by other students. When all of the bullying behaviours were considered together, 38 per cent of Australian Year 4 students reported almost never being bullied at school, the same proportion reported being bullied at school about monthly, and 25 per cent of students reported that this happened about weekly. The incidence of bullying seemed to decrease at Year 8 level, with 58 per cent of students reporting that they were almost never bullied, 31 per cent that they were bullied monthly and 11 per cent that they were bullied weekly. Of interest was the perception of being safe at school for those who report being bullied on a frequent basis (weekly) compared to those being bullied on an infrequent basis (almost never). It is likely that the relationship between the two is somewhat cyclical, however these data present one way of looking at the question. 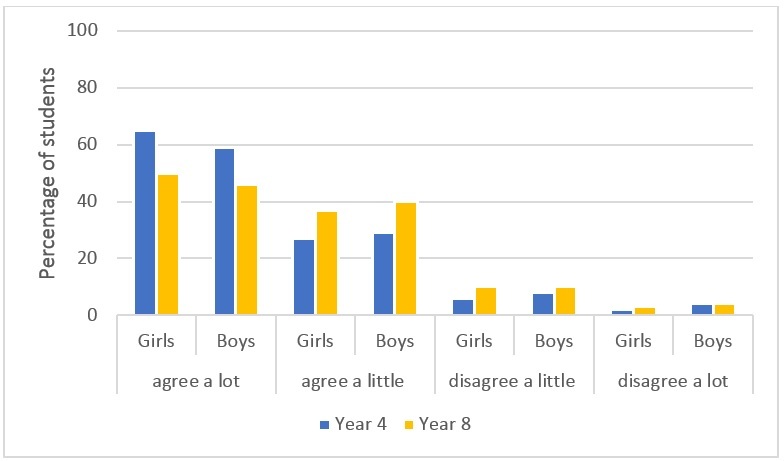 At Year 4, 76 per cent of girls and 71 per cent of boys who report almost never being bullied also strongly agree that they feel safe in school (Figure 3). Of those bullied frequently, in this case on a weekly basis, the perception of safety at school is still fairly strong amongst primary school students, with 50 per cent of girls and 41 per cent of boys reporting a high level of safety at school. Bearing in mind the data from Figure 1 that told us that 50 per cent of girls and 46 per cent of boys at Year 8 strongly agreed that they felt safe at school, these data reveal that if students are rarely subject to bullying, 62 per cent of girls and 56 per cent of boys feel safe at school. On the other hand, for those students who are bullied frequently, school is no longer a place in which refuge can be sought, with only about 17 per cent of both girls and boys feeling safe at school. Overall, Australian Year 4 students are more likely to have a strong belief in their safety at school than Year 8 students. At both year levels, on average, girls tended to feel safer than boys. 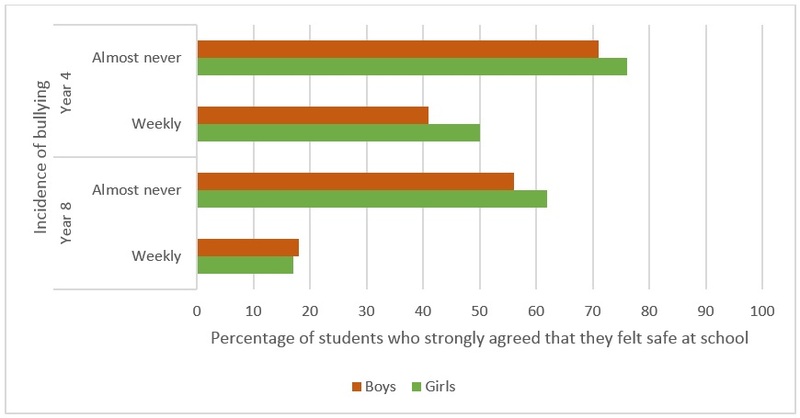 As both girls and boys progress through school the academic achievement gap between those students who feel very safe in school and those who do not also tends to increase, but feeling safe in school appears to have a stronger relationship with academic achievement for girls than boys, and this increases as students move from primary to secondary school. This analysis also points to a relationship between bullying and perceptions of safety. This link becomes stronger as students progress from primary to secondary school. If bullying is targeted specifically by schools then the proportion of students who feel safe at school could well increase. Chavatzia, T., Engel, L.., & Hastedt, D. (2016). Where are the immigrant girls? (Policy Brief No. 12). Amsterdam, The Netherlands: IEA. Katschnig, K. & Hastedt, D. (2017). Too scared to learn? Understanding the importance of school safety for immigrant students (Policy Brief no. 15). Amsterdam, The Netherlands: IEA. Prusinski, E., Hastedt, D., & Dohr, S. (2018). Academic achievement and feelings of safety: A closer look at gender and grade level differences. IEA Compass: Briefs in Education No. 5. Amsterdam, The Netherlands: IEA. I would like to add another kind of issue that affects feelings of safety at school that isn’t covered here: food allergy risk and food allergy bullying. From my experience as a parent, the risk and feeling of not being safe increases greatly in high school for the approx 1 in 30 children who have anaphylaxis. It ranges from a low level but constant paranoid vigilance for their allergen, to episodes of accidental contamination caused by thoughtlessness (my son has had cross-contaminated rubbish thrown into his lunchbox, as a ‘joke’; then he couldn’t eat), to having to remove self many times from games in the playground (cross contamination risk of playing handball because the other kids were eating chocolate bars containing peanut traces that had been sold by the school canteen) or the classroom (if a child gets out a peanut butter sandwich in class (has happened), or a teacher brings food in to share/conduct food experiment (has happened)); or an inability to participate in food technology classes because touching the food could be unsafe (2 terms of subject lost)); or threat of or actual attack by other students (my son’s allergic friend was spat on by another boy when they were in Year 7, in his face, to ‘prove’ he had a peanut allergy). Allergic kids feel much more vulnerable and unsafe at high school than primary school; and this lower feeling of safety is more consistent (every day) with life-threatening consequences. In my (child’s) experience of high school there is a much greater assumption of self-care (by a child, in a place they can’t control - school) combined with a huge decrease in school concern and allergy policy enforcement by teaching staff. I would guess it is generally worse for boys than girls, and of course all schools will vary. It would be great to see further research and education in this regard.